Our four “state of the art” conference and wedding venues can cater for up to 250 people. Not to mention our beautiful Gazebo that will add lots of flair to your function and will do any ceremony justice. Our professional team and conferencing coordinator will assist you with all your requirements. Fully air-conditioned, our conference venues are set up with standard linen with branded note pads and pens, bonbons, as well as flip charts and white boards. 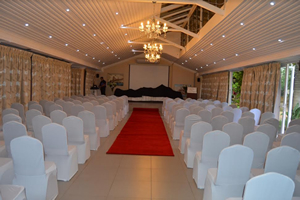 Conferencing tools such as projectors, sound and recordings can be booked according to your conferencing requirements. Breakaway areas, bar and restaurant are available. All other requirements such as beverages, snacks and lunch are tailor made to suit your individual needs.